Well, here it is folks! The moment that you all (or maybe just I) have been waiting for! The true reveal of MajorRig! Finally, a system to be proud to show off as a the true bastion of MajorsHouse’s foray into PC gaming! But let’s be honest here, its still a work in progress! For those who may not know, I had recently began buying up parts to do a true PC build after purchasing parts during the summer to make “something” that passed off as a PC to decent results. I had been moving along pretty steadily to beef up the system. First off, I started with a brand new MSI R7 250 graphics card. I had since purchased and am currently using a new reference RX 480 tuned by XFX. During the downtime, I began to take note of a few things. As you saw before, cable management in the current case was virtually non-existent. When it came to switching out the R7 250 with the Rx 480, things would get caught up int eh mess of cables. I would get lost trying to figure out where things went and ultimately had to disconnect a lot of the cables from the motherboard so I could get the devices switched. With a small case and so much obstruction, nothing was getting sufficiently cooled. After streaming and gaming sessions, my office turned studio became a sauna during summer months, even with the AC going. Granted, I live in NC and, after Kaiden was born, the AC was turned off for fear that my son would catch a cold. I had a feeling between that and with fall and winter fast approaching I would need something to keep the components cool when we switched from AC to heating. But why stop there? Why not just build a new PC? So, I began working on plans to build a second PC that would be the one true gaming PC while using the old one as the streaming setup. 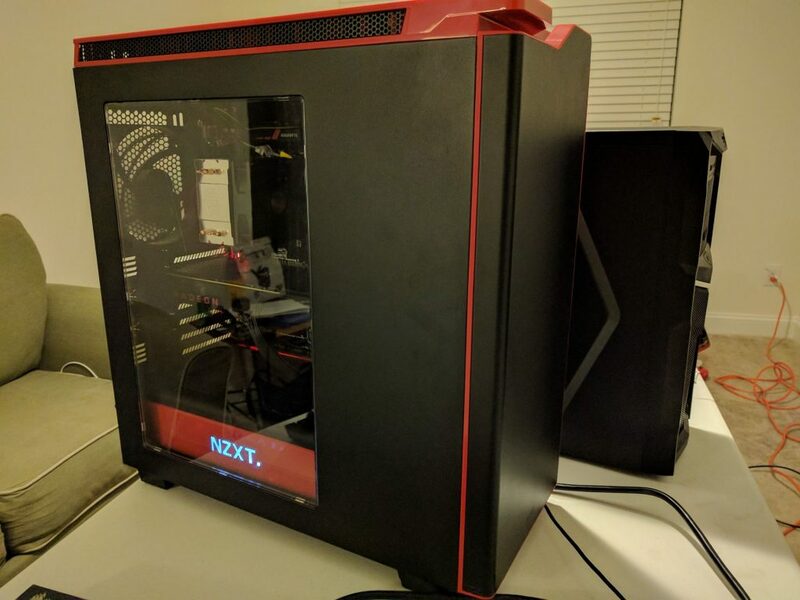 This new PC would not only have the new case, but everything was going to be new except for the RX 480 which would have come out of the old PC and replaced with the R7 250. So, the purchasing began. I started with the GIGABYTE G1 Gaming GA-H170-Gaming 3 motherboard, the Corsair CS-M Series CS750M 750W modular power supply, and the NZXT H440 case featured below. First off, showing off the inside of the case with the new Gigabyte motherboard, Intel Core i5 6500 processor (now Core i7 7700k), Cooler Master Hyper TX CPU cooling unit, two PNY Anarchy 8GB sticks of RAM, and RX 480. The beautiful thing about this case is the amount of space for the all the components and the cable management features that allow for a lot of air to flow through to keep everything cool inside. Also, on the bottom, you can see where your 2.5″ HDD or SSD drives could go. The cooling unit was an emergency replacement for the new system. The i5 came with its own cooling unit which I had broken when trying to remove it. I had not realized that initially when I reinstalled it in the new case and, as such, CPU temps rose significantly. Luckily, I caught the issue in time and was able to get this one fairly cheaply at a local computer parts store. Here’s another shot of the cooling unit, RAM and GPU. While the RAM was in the original machine, these are actually the second set that I had purchased after having made the mistake of purchasing DDR3 sticks for a board that supported DDR4. This time, when purchasing the new board, I made sure to make sure the RAM support matched the RAM I was originally going to purchase and the RAM I already owned. Its hard to tell from this shot, but this motherboard and case (which are both a lot bigger than the old ones) now has the space and arrangements for two giant cards and makes it super tempting to buy a second card for CrossFire use. A look at the back of the case shows of a lot of room for expandability. I love this case because the bars at the expansion slots no longer cover the display ports on the RX 480. Down at the bottom of course is the power supply. I love how the H440 was designed to hide the power supply and give the system a more professional and display-worthy look. Now for the unsung hero…the other side of the case. This is where cable management comes alive or, in my case, comes to die. As you can see, the power supply on the bottom is feeding cables through various holes and slots in the case to show a minimal amount on the other side. Here is also where you’ll find the drive ways for 3.5″ HDDs, the system fan and light controllers, and easy access to the back of the motherboard for more advanced cooling options. This is the system fan controller. It isn’t anything spectacular as it runs all the fans at the same speed all the time. As you may have seen in the case video, there are options to add more fans up top or just switch up fan configurations all around. This is where you would plug them up. And this is the light controller. The lights are actually controlled by a little button on the back of the system in the top left corner. I highlight it and show it off in the video at the top of the post. And here are the drive bays. For the time being, I think I’ll keep this open as this could cause heating issues if you start filling them up with drives. It shouldn’t be too bad though as there are plenty of space between them, but if you start doing a lot, this may be one place to look. So, that’s pretty much the grand tour of MajorRig 2.0. There are still plenty of things that are coming, but may not be here until after Christmas. I do recommend you all stay tuned as I’m sure this list will be updated very soon. Update: The list now reflects the Core i7 that I installed and Samsung SSD.